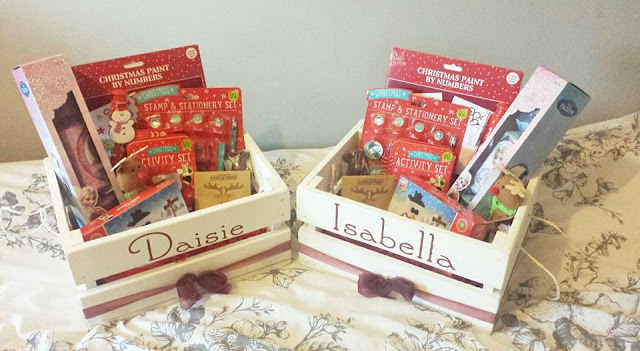 This year I made the girls boxes a little more of a permanent fixture and something we will pull out every year if I haven't found another use for them once Christmas has passed. I went for a plain crate from eBay and done the finishing touches myself with Andy's help, Now I have the crate bug and I want crates in every room! I'm lucky enough that Andy owns his own vinyl cutting machine so he cut the girls name out in vinyl sticky back and I used that as a template for me to paint onto the boxes one of Issys L's bled slightly under the sticker but I was in no way going to make it worse by correcting it afterwards so opted to just leave it be. 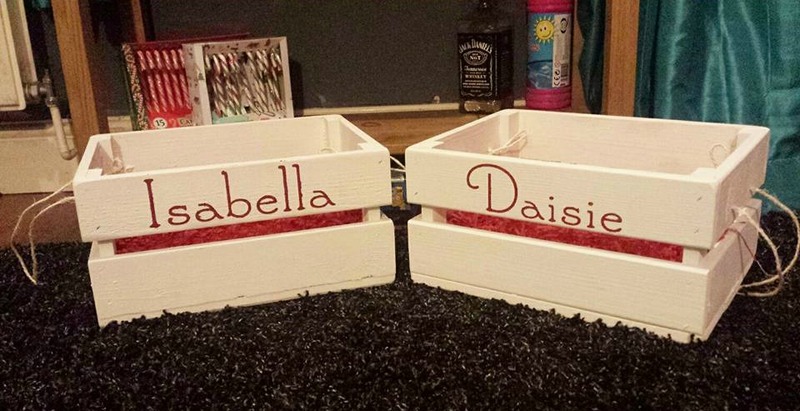 that includes the cost of the ribbon and paints to paint them white and the red for the names. All of the items inside cost me no more than £1 each!! I planned to get a lot better photos on my camera but it just wasn't happening I always remembered at the weekend with little eyes around who have been lead to believe the boxes I was painting were for Daddy's tools and to this day they still believe so. With Christmas just round the corner I'm running out of time way to quickly to get any decent pictures of them with school plays to attend, christmas shopping to finish and whatever else likes to pop up this time of year I'm sure you'll forgive me for my shoddy phone photos. Have you done a Christmas eve basket this year? I'd love to read all about them if you've blogged about them! This is such a great idea and I love that you did it yourself. My little girl is starting to get so excited about Christmas so we are stepping it up a notch for Christmas 2016. These will definitely be joining my make list!